NEW YORK -- Stocks and oil prices plunged again Thursday on spreading fears that China's economy, a major engine of global growth, is sputtering. It was the worst one-day drop on Wall Street since late September, with the Dow Jones industrial average shedding nearly 400 points. The main U.S. benchmark, the Standard & Poor's 500 index, has now had its worst four-day start of a year in history. The price of U.S. crude oil plummeted to its lowest level in nearly 12 years because of worries that the slowdown in China will translate into lower demand for energy. The sell-off came after China allowed its currency to weaken further, a dangerous omen for the world's second-largest economy. China's main stock index plunged 7 percent before trading was automatically halted after just 30 minutes. The selling spread across continents, sending indexes sharply lower in the U.S. and Europe. "The management of the Chinese economy is the real concern," said John Canally, chief economic strategist at LPL Financial. "All that matters for markets right now is 'China can't get their act straight.'" China could be in store for more declines after the communist state's market regulator suspended automatic trading halts that were put in place Jan. 1. Those halts, which were triggered twice this week, are increasingly seen as inadequate for preventing volatility. The downturn in the U.S. has been concentrated in technology stocks, which could suffer if demand for iPhones and other electronics weakens. Apple sank 4 percent and has now fallen 27 percent since July. Thursday's drop pushed the tech-heavy Nasdaq composite index into what market watchers call a correction, or a drop of 10 percent from a recent peak. The Nasdaq has fallen six days straight. The Dow sank 392.41 points, or 2.3 percent, to 16,514.10. At one point it was down 442 points. 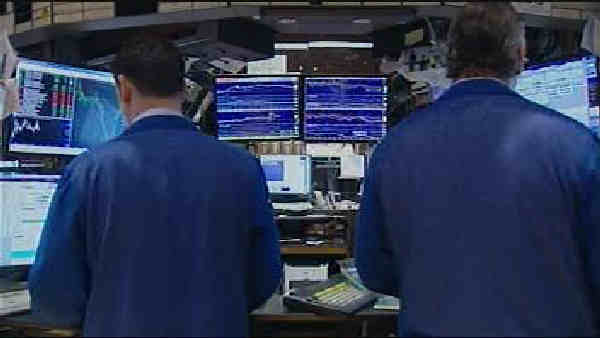 The S&P 500 index gave up 47.17 points, or 2.4 percent, to 1,943.09. The Nasdaq composite index dropped 146.34 points, or 3 percent, to 4,689.43. While the Nasdaq is so far the only major U.S. index to enter a correction, the two others are getting close. The Dow is down 9.8 percent from its peak in May, and the S&P 500 has lost 8.8 percent since then. European markets also dropped. Germany's DAX slid 2.3 percent, France's CAC 40 gave up 1.7 percent, and Britain's FTSE 100 lost 2 percent. U.S. crude plunged to its lowest level since February 2004. It sank 70 cents, or 2.1 percent, to $33.27 a barrel. Brent crude, the benchmark for international oils, lost 48 cents, reaching $33.75 a barrel in London. Brent is trading at 11-year lows. Apple, the world's largest publicly traded company, had its biggest loss in four months. Financial stocks also slumped. Citigroup gave up $2.56, or 5.1 percent, to $47.56. Aerospace giant Boeing fell $5.82, or 4.2 percent, to $133.01, and freight railroad Union Pacific felt $1.75, or 2.3 percent, to $73.08. 2016 has started with a series of warning signs about China's economy. Those worries about China have drowned out signs that the economies of the U.S. and Europe are doing fairly well. Thursday's selling came after the Chinese government allowed its currency to weaken against the dollar in a reflection of sluggishness in the country's giant economy. Earlier this week, economic data caused investors to worry about a slowdown in China's manufacturing and service industries. "China's been such a big driver of global growth for 15 years and now they're not, and they don't seem to have a plan for the next 15 years," Canally said. The price of gold added $15.90, or 1.5 percent, to $1,107.80 an ounce. Silver rose 36.8 cents, or 2.6 percent, to $14.344 an ounce. The price of copper declined 6.6 cents, or 3.2 percent, to $2.022 a pound. In other energy trading, wholesale gasoline declined 1.6 cents to $1.146 a gallon and heating oil lost 1.5 cents to $1.066 a gallon. Natural gas rose 11.5 cents, or 5.1 percent, to $2.382 per 1,000 cubic feet. The euro rose to $1.0927 from $1.0788. The dollar fell to 117.750 yen from 118.38 yen. Bonds prices rose. The yield on 10-year Treasury bond fell to 2.15 percent from 2.17 percent.